This is a great layout, and I will definitely be using it again! I used the measurements Natasha posted. The sentiment is popped up on dimensionals because of the bulk of the eyelet. The sailboat is colored with both copics and aquapainter/ink refill. The coloring is straight up no shading except for the water. What a wonderful card! 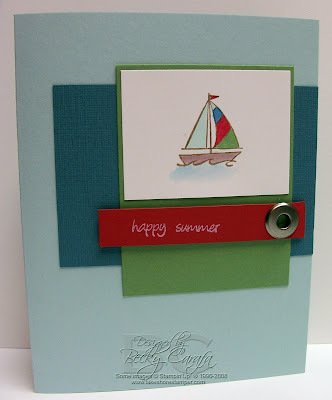 Love the colors and that cute sailboat!! Oooh, this is so wonderful! Simple, stunning perfection!! What a fabulous card, Becky! I love the clean lines and the color combination. Great job! Love the clean and simple look! It's so summery! I just came over to say hi and congrats! Its funny, because when I jumped on over, I realized you designed for Stamp Something and thought, "oh I know you. ", but not really KWIM? Anyway, love the sailboat! hey becky awesome blog u have here...will add u to my blog roll...do drop in my art blog sometime....its called kaikriye! FAB layout! I feel a case comin' on! Great colors, love the little swish of blue for water.